We've been totally goofing off this week. Jeff is enjoying playing an Xbox Oblivion game and I've been goofing off reading and playing on my computer. I should be sewing . . . 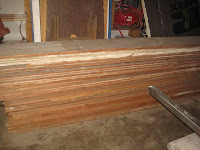 Anyway, while surfing on craigslist, I found someone selling a stack of 1x12 fir boards salvaged from a 1922 building. I emailed him and he offered to deliver for an extra $10 and we agreed. Since I hadn't actually seen the stack in person, I didn't realize quite how much of it there was. Some of the boards were actually longer than our garage and we had to cut them down so we could fit them in and still close the garage door. The stack is surely more than 2' high. I may actually have to re-sell some of it, because I'm not sure what we'll do with this much wood. Though, if these boards clean up nice with a planer, I may have to redesign my closet interior to use this wood instead of plywood. 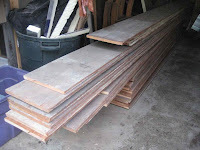 If not, we'll probably use a bunch of it to build shelving in our front storage area. What a score!! 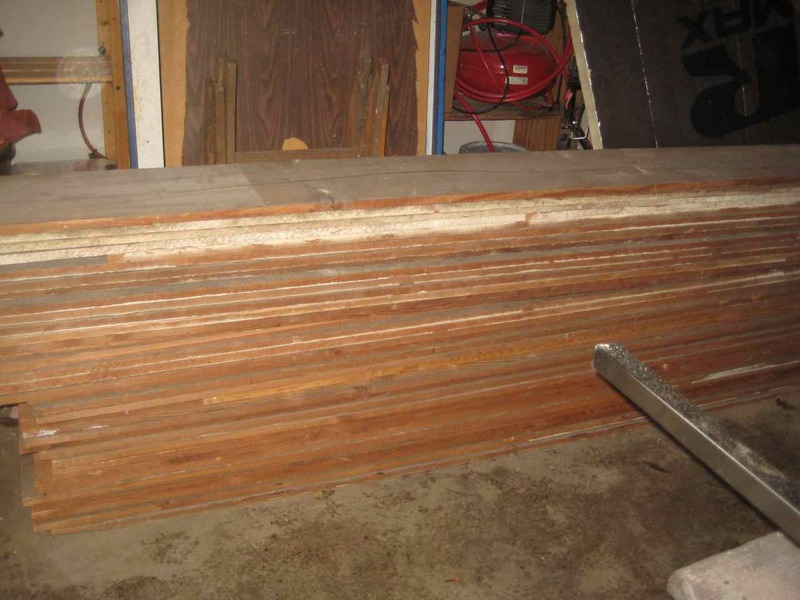 They do not make wood flooring like they used to...and fir on top of it. You have to love CL.